Join me in one week when my good friend Alisa Clickenger (Women’s Motorcycle Tours) joins me for a Live QnA about Riding Gear. Originally, we created this event for a Facebook Group called Motorcycle Mentoring, for women riders look for female mentors. If you’re new to riding and are looking for great advice and feedback from a wonderfully supportive group of women riders, this is the group for you. All riders, all riding lifestyles, all ages. I consider Alisa to be one of my mentors and long time friends. When we first met at the IMS 8 years ago, I was inspired by her personal riding stories. She has always been a source of encouragement and motivation for me, and I am so proud to call her my friend. I’m excited to participate in this QnA and give you all the answers you’ve been waiting for. Whether it’s how to find the right fitting jacket or how to find a pant that fits your body type. And any other gear questions you might have that you’ve been hoping to ask but aren’t sure who can help you find the answers. Then wait for your confirmation email containing instructions to join the call Online Live Stream, OR via telephone. You can also call in just like a conference call and listen in and participate that way if you don’t have access to the internet! If you have any questions, post a comment here or send me an email. Note that everyone must register individually because you will receive a link that’s specific to your email. You do not have to use your webcam if you don’t want to, either. You can just watch! Bring your questions or if you’re already a member of the group you can post your questions in the Facebook Event there, or post a comment here. These women’s motorcycle jackets are on crazy sale at RevZilla right now. I’ve added a few notes for you to see if they’ll fit you the woman rider in your life. If they do, then you’ve just scored a really great deal! As always, drop me a line if you have questions about sizing or fitment. 1/ Rev’it Tornado Jacket, Euro 40 and 42, now $197. This jacket is a great 3 season (spring, summer, warm) coat for your sportyish bike, your adv/touring bike and even your cruiser. Keep in mind that these numbers are based on measuring your real waist. If you’re not sure how to do this, please watch this video. I know what you’re thinking, the Rev’it Size Chart says otherwise. Let’s just say it’s not perfect. But then again, what is? (okay, Cheesecake. Cheesecake is always perfect). The Tornado is ideal for slimmer body types and those of you looking for a longer waist and sleeve length. Keep in mind that the liner is removable so always try your linered jackets on with and without the liners to see all the different combos and fitments you might be riding in. If you’re not sure what to order, think about how snug you like your gear. If you want a very fitted fit and your Chest is 43.75, then order a Euro 42. If you have questions, just let me know! My friend Sarah in a size small with a 43” Chest, 37.5” Waist, 43” hips. She’s also ~5’2”. Perfect Apple Fit. This is another great 2-3 season jacket, but without a thermal liner I’d say that it’s best as a Spring/Summer jacket. Keep in mind that with Olympia your rain liner can be worn outside or over the jacket when it’s raining. The fitment is very, very very generous and I would say that the alpha sizing is oversized. If you generally buy a small, you’ll find it to be a looser small. Especially in the bust, shoulders and hips. 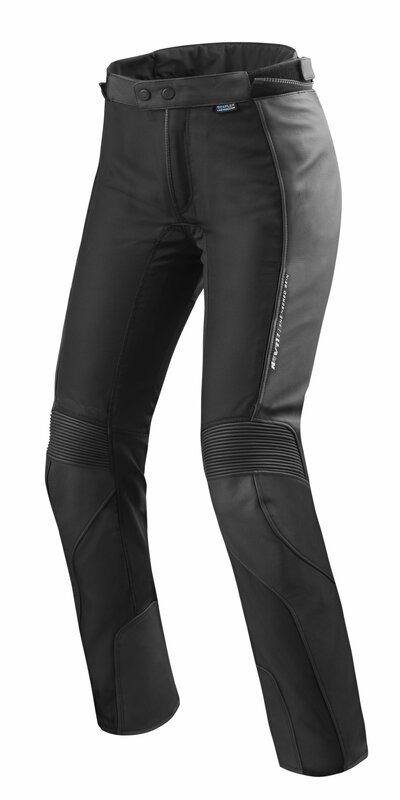 The Switchback is ideal for a very short waist, and generous hips. Think Apple Shape. For reference, a small fits a woman with a 38” Chest, 34” Waist and 43” Hip. It flares so much at the hips that anyone who needs a very large hip space will fit this jacket (assuming you don’t need a smaller waist as well). Another great deal right now for the same body type: Cortech for $109. But upgrade the armor with D3O, please! My gorgeous friend Alisa (~5’10”) in her Levante (46) Taller Fit. Another 3 season favorite, like the Tornado above. This one has a slightly different fit in that it has extra long sleeves and torso. Also more cinching and adjustments at the waist, forearms and bicep to make it fit tighter without the liner. Since only 42 is available, you’ll need at least a 41” chest up to 44”. I’d recommend anywhere from a 42” - 45” waist given the adjustability that it has on each side. The liner is thermal and waterproof so keep in mind that when it’s out the jacket will fit a half size larger. Given how long the sleeves run, this is ideal for someone who is taller and needs as much length as possible in the torso and sleeves. I hope these help. If you need specific recommendations, please let me know! This year I was honored to be a volunteer on the staff that put together the Annual Women's Sportbike Rally. I went once before in 2015, but only as a sponsor / attendee. This year I joined as not only a sponsor of the workshops for both West and East rallies, but I also climbed in board to help Brittany with marketing efforts. I'm excited to continue volunteering time next year to such a unique rally experience. Both rallies served to help women who love sportbike riding, to meet other women who enjoy the same riding lifestyles and to educate and inform. Any profits generated from the event are fully donated to the Skin Cancer Foundation. As riders, are are constantly exposing ourselves to the outdoors and communicating this message important for the event due to the loss of Tiffany Weirbach “Sportbikegirl”. After losing her life to Melanoma, the event has carried on her memory by sharing her story over and over again to the next generation of sportbike women riders. I was too busy having fun with my girls so I didn't heavily document my trip but if you followed my Instagram earlier this summer you saw some awesome riding photos. I also had the opportunity to borrow a wonderful friend's Triumph for the event. Does she look familiar? :) Actually she's a much more glamorous version of Goldie with her awesome Rizoma farkles. This was bike was actually lower (but not lower-ed due to the change in seat type) and sportier than mine. More details on that in a separate post to come. But my favorite moment from the rally was connecting with Kiona's mom, Birgit. She had remarked to me how difficult it was for her to find proper riding pants. And she wished she had a pair of comfortable leathers that she could feel protected and comfortable in. Well lucky we're almost the same size. I gave her my two piece Rev'it outfit and told her to take them for a spin! Birgit was very petite and trim. Although she could have sized down to a 34, she preferred the looseness of the 36 that I have. (my hips are too big to fit a 34). She didn't know that pants like this existed and would fit her so well. Kiona's mom wearing her own Rev'it Galactic Jacket and Gear 2 Leather Pants. I couldn't be happier for her, I'm so glad she found something she loves to wear. It's these little moments with people that I enjoy the most. If I can help someone I'm thrilled to do it. At the East Rally I met so many cool women again and got to chat with a few gals who needed help with gear. I also did a Helmet Fit Workshop which I think got everyone rethinking their helmet size (one gal needed to go down 2 sizes!). I'm excited to teach and sponsor workshops again next year at both events because they're so important to increasing rider skills and education. Check out some of the highlights and visit my Instagram feed for more pics including towing our bikes with the Jeep all the way down to Deals Gap! I am looking forward to next year's rallies, although I may not be able to attend both events, I will be supporting them 100% with volunteering as much free time as I can to ensure both locations are a success. These events would not have taken place if not for the contributions of these specific sponsors who provided money, raffle donations and / or volunteered their own time to assist with our event. THANK YOU TO THE SPONSORS! Next year's dates have NOT been announced as of this post. Please sign up for the newsletter and follow the rally on Facebook and Instagram to find out as soon as dates and locations are announced for 2018!